Highlighted by its gorgeous views of the Pacific Ocean and located in the heart of Mission Beach, this two bedroom, one bathroom, third-floor, ocean-front condo is perfect for a relaxing beach retreat. Entering the third floor either via stairs or elevator, the entrance leads directly into a fully equipped kitchen with tiled floor and beautiful marble countertops. The kitchen has everything needed to prepare a home-style family meal, or cocktails to enjoy the views from the living room and balcony. Directly around the corner, the first bedroom is home to a twin-over-full bunk bed, perfect for another couple or the kids. Additionally, everyone is sure to enjoy the collection of board and card games, beach chairs and umbrellas located in the bedroom. The hallway attached leads to a tiled, full bathroom with his and her sinks. Next, the fabulous master bedroom has amazing views of the ocean front, a queen-sized bed, a sliding closet, plus the extraordinary mirror and vanity, not to mention private access to the balcony. 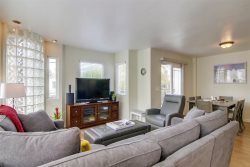 Nearby, the spacious dining and living room are combined, including a table seating four, a comfortable sofa to lounge, plus a matching accent chair. The entertainment center is home to a massive high-definition television, cable TV and WiFi, a DVD and VCR player, plus an Xbox. Lastly, the attached balcony, with amazing views, also includes a small bistro set and additional chairs with cushions. 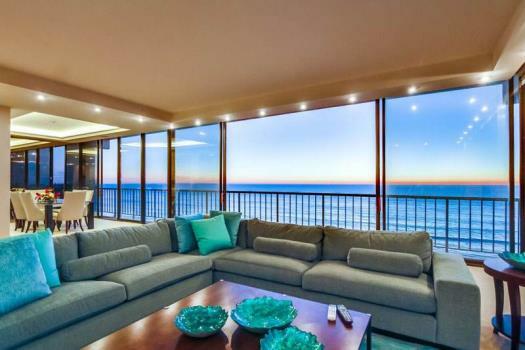 The clear Plexiglas railing offers unobstructed views of the ocean and sunset from the balcony and living room. There is a strict curfew on noise indoors and outdoors in this quiet complex from 10 PM to 8 AM.